I like this mod very much. Could you please add the possibility to see the crops maturity rate for Harvestcraft, the same way it is done for the regular Minecraft crops? Also, could you add .lang files to the mod so that I can translate the texts into French. Sure I add both soon, do you have some other suggestions? Can I spotlight this, I aim to help out authors that have mods that have small attention. I like the way it is presented to. I'm not a big Waila or tooltip type person but I find that the more less known mods I play the more I need something to help me out and also to help out with details like fluid readings, mob health, the inventory one is cool, and the light level and Redstone strength is nice too. I have few options I could look into but I like this one more and have played around with it for a bit and enjoy it's usefulness. If you don't want me to that is up to you. I don't mind. Just asking. Thanks, I'll get onto it right now! Hey canitzp, I was wondering if there is a way to either disable or move the TUMAT button in the top left when you open your inventory? It is covering up other buttons. Yea, a setting where we can offset that button would be really nice. I am working around it for now, as the other mod doesn't allow for configuring where their buttons go, either. Currently building a modpack with this mod in it and want the users to have access to all buttons. hi canitzp, thanks for this mod - can't have too much info in minecraft as the game components and mods increase in number and complexity - is this mod compatible with waila and wawla? or do we have to use one or the other. thanks. This mod isn't compatible with waila or wawla, but it is also still in developement and as new features I add things like harvesability or light level to the tooltip, but as config option so everyone can enable it if he/she need it. 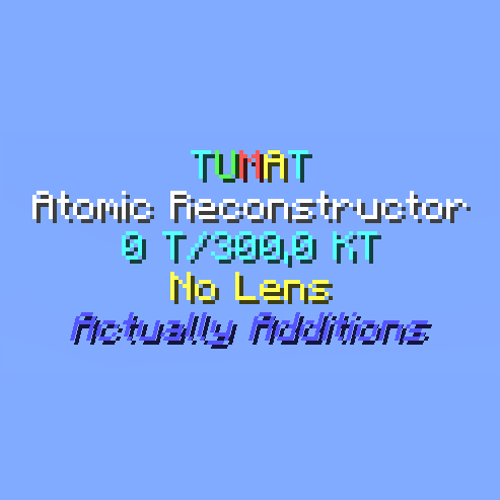 TUMAT itself should be a lighweight inworld tooltip mod, so these special abilities are dosabled by default and the server can decide if you can see these inforamtion.